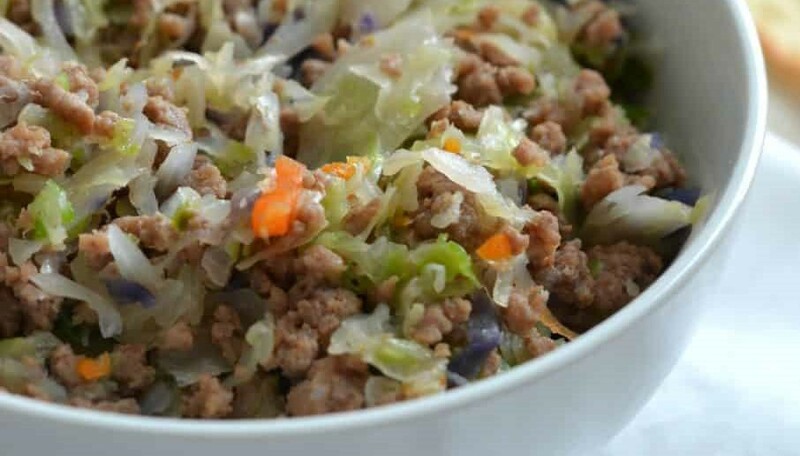 We’ve got my sister, Chris, to thank for this recipe, which is just a deconstructed egg roll served in a bowl. It’s incredibly versatile, so I’ve got three versions for you! #1 – The original recipe was created for an Instant Pot (the new-fangled pressure cooker) by Ashley of the I Don’t Have Time For That blog. But if you don’t have an Instant Pot, or if you’re vegan or vegetarian, my sister and I have versions for you! #2 – Chris doesn’t have an Instant Pot, so she created a skillet version that still came together very quickly. It also relies more on fresh ingredients and a couple little additions that provide more depth of flavor. Serve! She left out the won-ton chips, though her husband had his over brown rice. She said that the next time she makes it she’ll add chopped peanuts and some fresh veggies for more crunch (like julienned carrots, green onions, bean sprouts), which I think sounds delicious. #3 – If you’re cutting out meat from your diet, you could use a ground meat substitute, but I like to use tofu. Start with a 16-oz package of firm tofu. Wrap the tofu in a clean kitchen towel or several paper towels. Place a heavy plate on top, and allow the tofu to rest for at least a half hour (you’re pressing excess liquid from it). You could do this in the morning and leave it in the refrigerator so it’s ready when you get home from work. Heat about 2 Tablespoons of oil in a skillet over a medium-high heat, crumble the tofu in by hand, and saute for about 5 minutes. Add ½ Cup vegetable broth (or liquid of your choice – any broth, white wine, sake, etc) and 1 bag of shredded cole-slaw mix. Cover and let steam for 2-5 minutes, depending on how much texture you’d like the veggies to maintain. There are several ideas here to work with, so use the ones you think sound best and have fun with this meal! Leave your comment below to let everyone know any tweaks you make, and your thoughts on how it turned out.